The VIA COMe-8X80 is a fanless*1 COM Expressform factor module that offers full 64-bit computing and high performance multimedia features suited for a variety of next-generation embedded applications. Available with a choice of 1.3GHz or 800MHz VIA Nano processors the VIA COMe-8X80 also integrates the unified VIA VX800 media system processor, replacing the traditional chipset with a unified single chip solution. The VIA VX800 incorporates VIA Chrome9 integrated graphics with support for VGA, and dual channel LVDS displays. 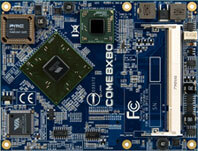 Targeted at industrial PC and large OEM customers focused on dynamic application segments, including advanced gaming, industrial automation and digital signage, customers can take advantage of a proprietary multi-I/O baseboard, or can utilize VIA's extensive technical support in developing a custom baseboard.